Mint Juleps are perfect for a Kentucky Derby party. Kentucky Derby party food is based on regional recipes and fun dishes that celebrate the unique Louisville culture and palate. Whether you're planning a sit-down meal or simple finger foods, there are plenty of recipes and ideas to choose from. If you're planning a traditional Kentucky Derby party menu, there are some dishes and drinks that are well-known derby fare. Here are some of the most common dishes. 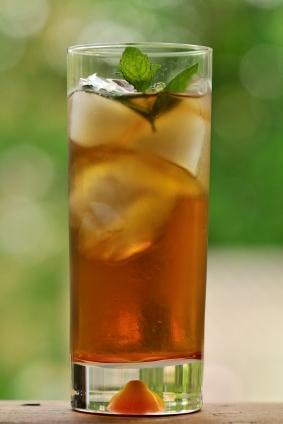 Mint Juleps - Party drinks can't be overlooked! The Mint Julep is the official drink of the Derby, and it's very easy to make. Henry Bain Sauce - Henry Bain Sauce is named after its creator, who was a waiter at the Pendennis Club in Louisville, in 1881. The recipe evolved over time, as many claimed Bain never made it the same way twice. This sauce was intended to be paired with wild game, but goes well with just about any roasted or grilled meats. A recipe for Henry Bain Sauce, from the New York Times food editor, can be found here. Toast the bread and set aside. Preheat the oven broiler. In a large skillet, melt butter over medium heat. Whisk in the flour until smooth. Gradually add milk, continuing to whisk the mixture. Add half of the cheese and mix well to make a smooth sauce. Remove from heat and add salt and pepper. For each sandwich, place two slices of toast on an oven-safe plate. This can also be done in a casserole dish or deep baking tray. Top toast with turkey, and then generously pour the prepared sauce over top. Sprinkle remaining cheese over sandwiches. Place the plates or baking tray under the broiler and broil just until the cheese is bubbly and starting to brown. Remove from the oven and top each piece with two strips of bacon in a criss-cross pattern. Serve immediately. There are plenty of other options to choose from when planning a Kentucky Derby themed party. Here are some recipes and suggestions to consider. Burgoo - Burgoo is a thick, hearty stew made with a variety of meats and vegetables. Celebrity chef Emeril Lagasse has a good recipe for this dish, which is traditionally served with warm cornbread. Benedictine Dip - Benedictine Dip is a tasty combination of cucumber and cream cheese, perfect for serving with crudités. It can also be used as a sandwich filling. The recipe can be found at the Chowhound website. Bourbon - Bourbon doesn't have to be served in a glass! You can add a touch of bourbon to everything from barbecue sauce for dipping chicken or appetizer-sized meatballs, to cake batter, giving your dishes a Kentucky flair. Biscuit Sandwiches - You can make great finger-food sandwiches with homemade biscuits and some sliced country ham. Make them even more authentic with a dab of bourbon-infused mustard. The Kentucky Derby is steeped in history and tradition, and the food associated with the event is easy to incorporate into any party menu. Whether you're throwing the party to celebrate and watch the race itself, or planning a special gathering for a fan, the party food is sure to be memorable.